Get ready for Naptown Roller Derby's third Season 12 home bout! 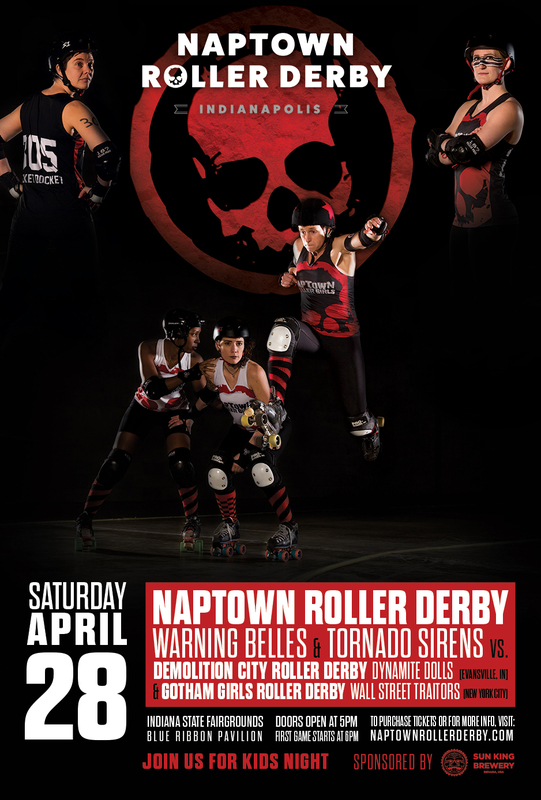 The Tornado Sirens and Warning Belles will be back in action on Saturday, April 28. The Tornado Sirens will compete against the Wall Street Traitors team of Gotham Girls Roller Derby — one of the top leagues in the world — who are traveling all the way from New York City. The Warning Belles will open the doubleheader event at 6:00 p.m. with a matchup against Hoosier favorite Demolition City Roller Derby from Evansville. This event will feature fun and games under the theme of kids night. Online ticket sales end at 10:00 p.m. Friday, April 27. Our community ticket vendors will have pre-sale tickets until approximately 5:00 p.m. the night before the bout.